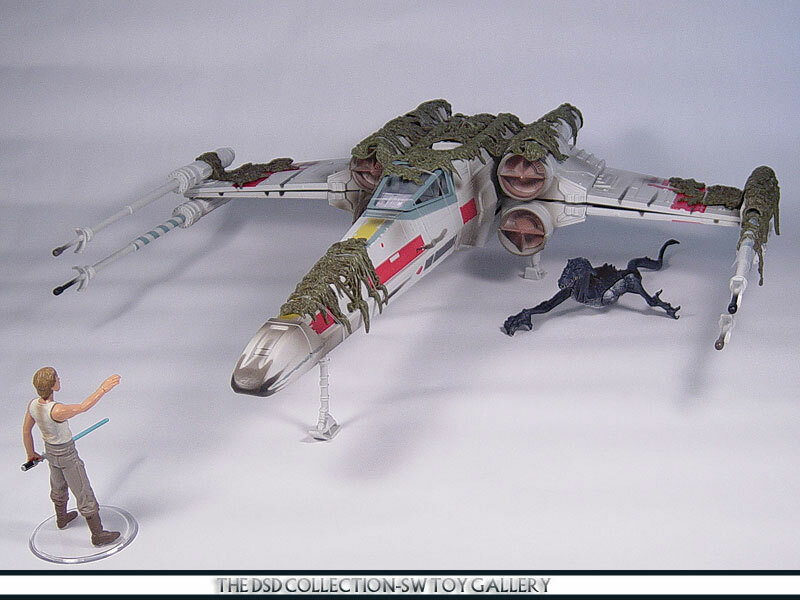 Introduction: Today VOTD features the updated Luke Skywalker X-wing with Dagobah Swamp Moss decor. When this X-Wing was released many collectors were finally satisfied with the larger POTF2 X-Wing mold was finally updated to house figures. As you all may remember the older large vessel had stationary figures and were not ...removable. Now we get an X-Wing that not only looks like he crashed it on Yoda's swampy planet but you can remove all that moss and have yourself a regular X-Wing. Totally worth owning. "After the Rebels are forced to evacuate their base on Hoth, Luke Skywalker and R2-D2 escape in Luke's X-wing fighter and set a course for the Dagobah system. After his guidance systems are scrambled by the thick atmosphere, Luke crash lands in a stinking marsh. Frustrated and alone, Luke is at first impatient with the strange, tiny hermit he encounters, only to find that this odd little creature is in fact one of the greatest Jedi ever to live. Yoda soon proves that size matters not when one is knowledgeable in the ways of the Force. After Luke's X-wing sinks to the bottom of the bog, Yoda levitates the massive craft out of the depths and places it on dry land. Soon thereafter, Luke must leave Dagobah and fly to Cloud City in his X-wing in order to rescue his friends from the clutches of the Empire. "